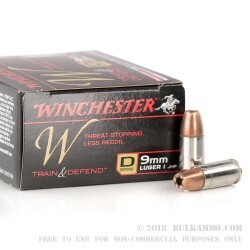 If you're not familiar with Winchester's W Train and Defend line, then it is time to change that. Winchester noticed that shooters looking for less recoil for their self-defense ammo are being underserved, and they also realized that shooters can't afford to practice with their self-defense ammo. As a result, they developed Train and Defend ammo. 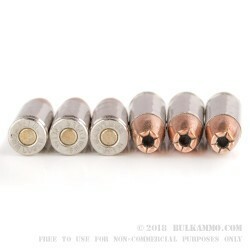 The Train ammo features a more affordable FMJ projectile that can be used for training, while the Defend ammo features a hollow point designed for self-defense. Both loads feature almost identical ballistics so you can practice with the Train ammo knowing that your Defend ammo will fire almost identically through your firearm. 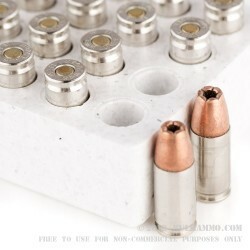 This ammo is the "Defend" ammo and features a 147 grain jacketed hollow point projectile loaded into a nickel-plated brass case. You can expect muzzle velocity of 950 feet per second and energy of 295 foot pounds. With the development of this ammo, Winchester continues to prove that they have the shooter's best interest in mind. 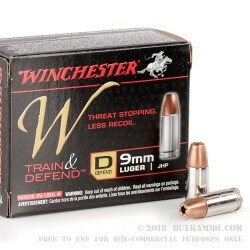 This ammo is made in the USA, so pick up a box of this Defend ammo, and grab a case of the Train ammo so you'll be ready for the next time you head out to the range!